You are here: Home / Diary / Iâ€™m No Angel! You would think we cats would dislike gray, rainy days — there are no sun puddles and the humans and dog are all wet when they come in from outside. But this time around we were glad. We were hoping that the rainy days would last until November… because we had a sneaking suspicion that my human had something unpleasant hidden away, something she was itching to torture us with. And what do you know, the first day the sun came out, we discovered we were right. 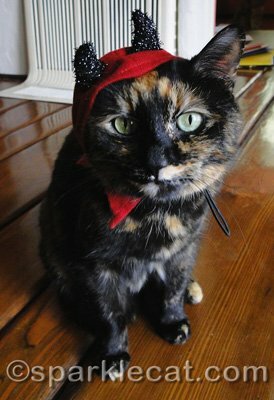 But just because my human was going to make us suffer through these costumes, it did not mean that we had to cooperate. 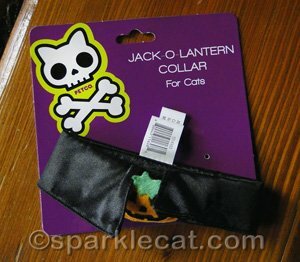 My human didn’t want to torture Boodie too much, so she just got her a “festive” collar. Boodie was so embarrassed that she didn’t even want to show her face. I think she is doing an imitation of Linda Blair in The Exorcist here. Of course, you know my human saved the worst for me. Ugh! I looked like a Floradora girl. I didn’t even want to watch Bird TV — I think the birds were laughing at me. My human said it was the worst Halloween photo shoot ever. We think you guys look adorible! Hahahahaha! You MUST put the bitey on whoever did this to you. I see you are very prepared for Halloween, you are gorgeous! Oh. my. Gosh! That is just horrible!! What did they do to you, Sparkle?! I would definitely go scratch on the couch or barf on the rug as their punishment. OMC, OMC, OMC!!!! Your human dressed you up????? The indignity of it all. Well, I never! Photoshop dressing is about all that I would tolerate. oh Sparkle… you look like one bad angel! at furst I thought it was a big fluffy hat.. you still look beetifull! the little devil looks up-tight 😉 hope Boodie gets her head back on straight! I would hate to think what we would be capable of if our she-human tried to do that to any of us. We would growl so loud!! She is very mean to you girls. Doesn’t she know how dignified kitties are? The angel costume was perfect for you though. You are an angel for putting up with her. Sorry, Sparkle, I can’t stop laughing. Oh, you poor dears! Good for you for NOT letting your Mom get away with these terribly humiliating things. Poor Boodie! (Did she projectile vomit & do a 360????) I’d’ve liked to have seen that! Sparkle, Mommy says SHE thinks your photoshoot was a roaring success! Holy Cod! The horror!! 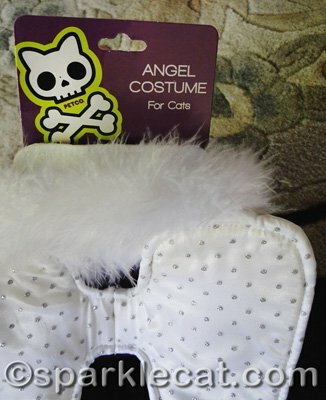 I understand Mom almost purchased fairy wings for me… Shudders! I finally taught my mom not to do that with me. 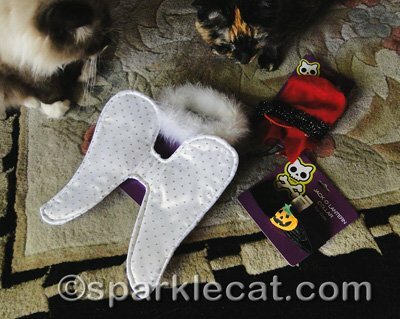 You are certainly not the right cat for that costume Sparkle! OMG, Binga you are SO FREAKIN’ CUTE!! I know if must be very humiliating for you but human mommies just love that kind of stuff! And I have to agree with BeadedTail above. 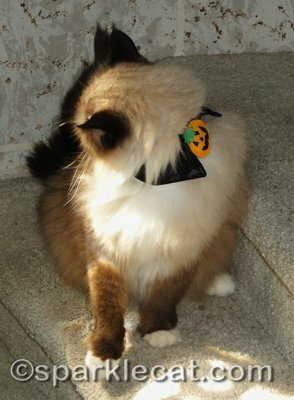 I think you mom got the costumes mixed up, MOL! Sparkle, maybe you and Binga have your costumes switched. Just sayin. We are profoundly embarassed for all of you! oh my gracious, the indignities. Sparkle, you do NOT look pleased! You remind us of what Mae West said: “She was as pure as snow and then she drifted.” MOL! Yeah, not well thought out in the costume department. I don’t know why you guys put up with that nonsense! Definitely bite your mom and shred the costumes, if possible. VERY unkind of her to do that to you. There must be SPCA regulations pertaining to putting costumes on cats…. Poor poodins!!! Good thing it isn’t Halloween yet! We like the last photo very much. Even with the dreaded costume, you shine! OMC – those are the cutest costumes. Now I’m jealous! Oh…ohhh Sparkle, we don’t quite know what to say. Great photos! 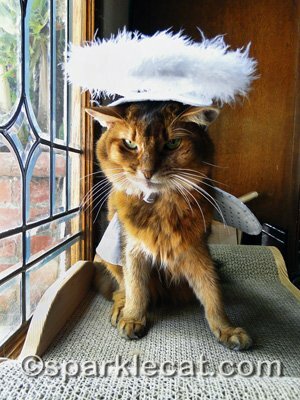 You know Sparkle, in many ways you are an angel…but you don’t need the costumery :). Say…you could wear that at Christmas too…oh, hang on, did we type that out loud? Hahaha! You all look very annoyed. Those feathers look good for chewing on though. Sparkle, that was horrible what the Mom did to you. But I gotta tell you, our Mom nearly burst laughing so hard. It is just the first glimpse does not look like something you would do and we know you wouldn’t do it unless forces. Now you need to further train your Mom. Hope the rest of the week is better for all of you. Take care. 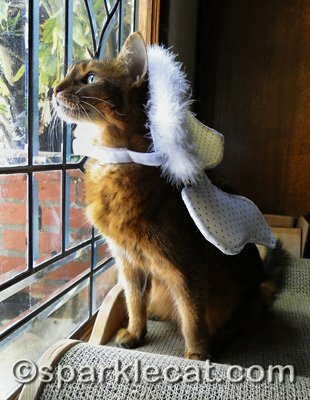 Sparkle, you look so beautiful as an angel! Sparkle, we feel your pain!! Why do humans hafta do stuff like this to us?? This is wrong, so wrong…. I’d be using the claw of doom on those monstrosities. Oh Sparkle, we agree totally….your human deserves a big bitey for that. And shred those costumes if you can. Devil Costume, That’s the best !!! 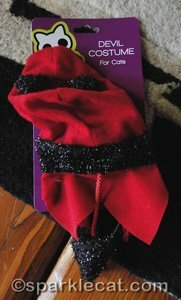 Oh Sparkle – how unkind your mum has been to you all – but we have to agree she chose the feathery one for you because she knew you would so not love it!! Put the bitey on her later if you haven’t already done it.